These little triplet babies came to Neema in May 2017. The boys, Edward and Elesha came to Neema from the hospital first because they were healthy. The little girl Esther came a month later after spending a few weeks in the hospital with gastric problems. The mom stayed with Esther in the hospital and we took care of the boys in the isolation room. When the hospital released the little girl Esther she was still very tiny, about 1.21 kilos when she came to Neema with her mom. 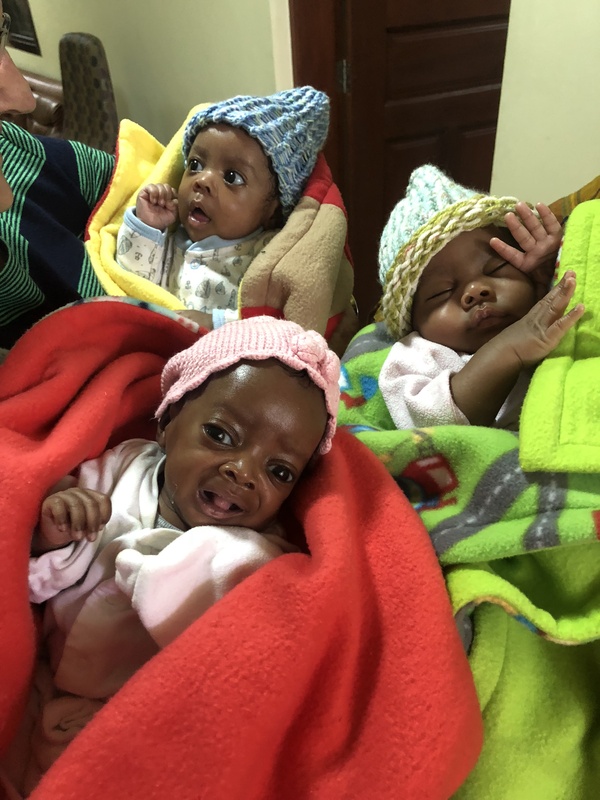 The single mom is HIV positive and does not think she can care for such a tiny baby with health issues and the boys so we have the triplets at Neema. We are helping the mom start a little vegetable stand that she can manage and be able to keep the triplets. We hope when Baby Esther is stable she and the boys will return home. We are paying extra staff around the clock to care for these babies and could really use some help. We are paying around 200,000 Shillings a month to care for the babies’ round the clock special care. That is about $100 per month. If you can help with that bill we would appreciate that so much. We hope to only have the triplets for 6 months or so.